I had a bracelet made for me. 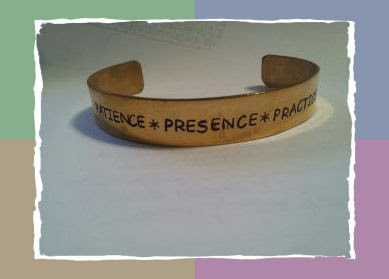 It is bronze and engraved: Patience, Presence, Practice. It helps to remind me, first to pause, then to be aware and in contact with the powers around me and finally to keep doing what seems right - because there will never be perfect and I will always need practice. It is a zen take on Pause, Pray, Act. I have had it about two weeks now. I use it each day, developing a deeper habit. Habits take time. The reward is how I feel when I am aware of what I am doing and how I feel at the end of the day when I take the bracelet off. This weekend was very restorative. We went to see Despicable Me2 because my 25 year old said we would enjoy it. My husband and I laughed so much we cried. Stress relief at its finest. How are you doing after your weekend? The bracelet is pretty. I want to see DM II too, but my teen daughter is at debate camp, so I am missing my movie buddy! Love the bracelet. Good meditation piece. My 23 and 19 year old saw Des Me 2 and loved it also. They both said better than Des Me 1 (which they also liked). We watched DM1 last night on cable and it was not as good as 2. A long time ago that bracelet would have been closer to fitting your fingers. It took a lot of patience to get here, practice to slog thru it and maintain and presence to see clear when the mind fog of goodies sweeps in. Every time I laugh I feel the funk fly out of me. Once long ago Oprah said she is not an easy laugh. I felt sorry for her. Apparently only dopes laugh a lot. Yay for dopedom!